As many businesses face budget cutbacks, many are turning to online advertising as a way to meet their marketing goals for less expense. So much so that Borrell Associates reported an expected gain of almost 50% in 2008 for local online advertisers, up to $12.6 billion. Local online spending is expected to make a 40% increase to $8.5 billion in 2012, then keep expending at a rate of 15 % over the next four years. The companies spending the most on online advertising were usually Internet companies, followed by newspapers, directories and TV stations, according to MediaPost Publications. 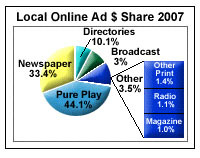 Newspapers are also web-headed, surpassing all other media companies combined, according to the article. The study by Borrell found that almost all online newspapers are also operating at a profit, as well. Local online radio stations are also operating at a profit, according to the study. It is said that necessity is the father of invention, and in this case necessity just might be the thing that propels us into the new age of online business and advertising. Previous Previous post: the UN united for nations to rise?